Everyone should have the most basic estate planning document: a simple will. Many people wonder if they really need a will. They may think that they don't have enough assets to bother with a will. Some people erroneously believe that a will causes your heirs to have to go through probate, leading to unnecessary expenses. However, a will is a good idea for just about everyone. Read on for some of the reasons to have a will. A will is a document in which a person declares what she wants done with her property at the time of her death. A will has no effect until the person who wrote it, known as the testator, dies. The testator can also revoke a will at any time prior to her death. If you die without a will, the state will distribute your property to your heirs according to the state's intestacy statutes. The statutes might call for a distribution that is similar to what you want. Then again, maybe they won't. State intestacy laws will provide how the sum total of your property is to be divided among your heirs. It can't provide for who will get certain specific items of your property. This can lead to many problems. Your heirs may not agree on who will get certain items of your personal property. For example, say you have inherited your grandmother's wedding ring and intend to pass it on to your daughter. If you die without a will saying that is what you want, your son may feel very strongly that his wife should have it. So even if you don't have a lot of assets, you may be concerned about making sure that certain items of your property go to the people that you want it to. You can do this with a will. Another misconception about having a will is the idea that having a will causes your heirs to have to go through probate, and that it will be difficult and expensive. If you die without a will, the probate court is still going to oversee the distribution of your assets to your heirs. There is absolutely no reason to think that this process is made easier or less expensive by your not having a will. In fact, it will probably be more expensive. For one thing, whoever administers your estate will probably have to post a surety bond if you don't have a will. If you do have a will, not only can you choose the person who will administer your estate, you can provide that he or she will not have to post a surety bond. If so, you really need a will. If you don't have one, the probate court will have to set up a conservatorship to manage your children's share of your property. A judge will decide who manages the money. When each child turns 18, he or she will get his share, whether they can handle it or not. If you have a will, you can decide who will manage your children's inheritance on their behalf and you can choose the age at which you want it to be distributed to them. More importantly, the will is the document in which you name a guardian for your children. Even if your estate is small, there are good reasons to have a will. You can create a will and other common estate planning documents on your own using quality software or books. It can be done in a couple hours for under one hundred dollars. If you're not comfortable creating these documents on your own, you can see an attorney who practices in the area of estate planning. This attorney can also help you decide if you need more advanced estate planning techniques and help you implement an estate plan that is best suited to your needs. 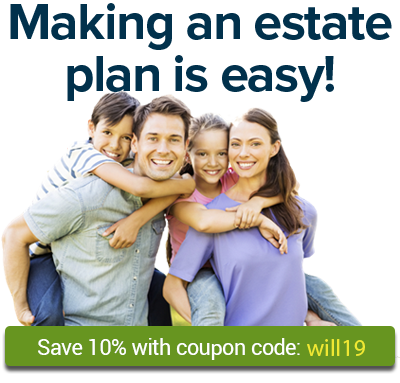 Keep in mind, an attorney will charge at least $1,000 to help you accomplish your estate planning goals.